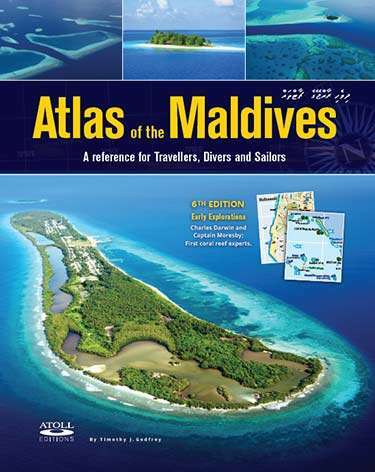 This 6th edition of Atlas of the Maldives has been fully revised and updated to reflect the many changes occurring on both land and at sea since the last edition in 2007. It includes new material on the early mapping of the Maldives and its impact on science. The writings of Moresby, Darwin and other recent researchers, are used to explain the formation, structure and geological history of the Maldives. A detailed atlas of the Maldives with maps showing resorts, all islands, reefs, and marine life features including dive sites, mangroves, turtle and bird nesting islands. Includes details on atoll formation and early mapping by Captain Moresby and the influence his maps and correspondence had on Charles Darwin’s theory of coral reef formation and subsidence. Timothy J. Godfrey has been researching the atolls of the Maldives since 1986 when he started work as a dive instructor and guide on safari boats. Prior to this, he worked as a journalist in Northwest Australia in 1983 and later travelled and worked on charter vessels and fishing boats in the Gulf of Carpentaria, Queensland and Victoria’s Southwest coast. In 1996 he started Atoll Editions and published Dive Maldives – A Guide to the Maldives Archipelago; Malways – Maldives Island Directory (later editions published as Atlas of the Maldives) and Maldives Divers and Travellers Map. In 2014 he co-authored Fishes of the Maldives with Rudie Kuiter. In 2007, he returned to marine studies and completed a Bachelor Science (Marine Biology) degree at James Cook University, Qld in 2013. Peter Kopp (petermichaelkopp.photoshelter.com), Luke Howard and Andrew Farr, Thomas Pickard (www.thomaspickard.com), Peter Verhoog (www.dutchsharksociety.org) and Tim Godfrey.